It’s a challenge not to fall in love with La Paz upon first visit. As well as being the highest administrative capital in the world and home to a vibrant arts scene, La Paz—along with its adjacent sister city of El Alto and Viacha, which make up the La Paz Metropolitan area—still remain fairly off-radar in terms of mass tourism (but have no fear: the luxury hotels Bolivia does have to offer are naturally concentrated in the most exciting destinations of La Paz, Sucre, and Santa Cruz.) While the Bolivian lifestyle expresses itself in its purest form at the weekly markets and year-round festivals, locals and guests are treated to impressive works of colonial and contemporary architecture, an excellent food scene, some of the best Bolivia luxury hotels, and the Teleférico La Paz-El Alto cable car system that doubles up as a rollercoaster and sightseeing tour with lofty cityscape views. 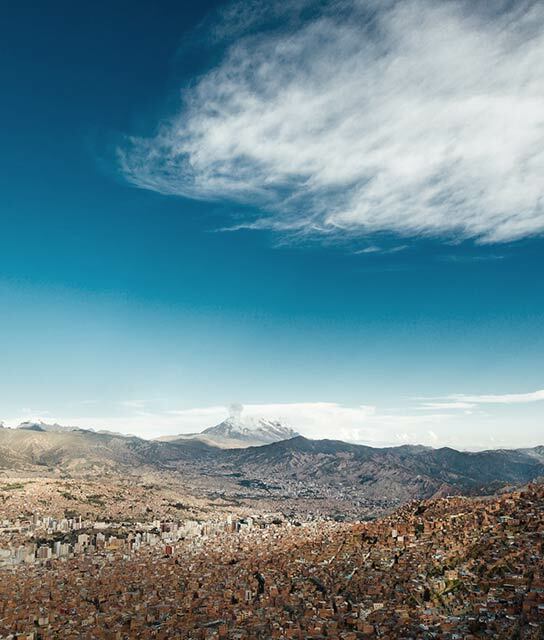 For those seeking an authentic Bolivian experience in a city that seems almost other-worldly, La Paz offers just that. Below find a list of our selection of boutique and luxury hotels in La Paz. Bearing the torch for design-led luxury in La Paz, Atix is a showcase for Bolivian culture, art, and gastronomy.